Did the EPA really silence a dissenting report on global warming? Did the Obama EPA really silence a dissenting report on global warming? Yes they did. But before anyone gets bent out of shape over this, it is worth noting that that is exactly what the EPA should have done. The report in question has been called a scientific report by many, but it is nothing of the sort. It was written by an economist (Alan Carlin), not a climatologist, that plagiarized fully debunked denier talking points. In short it was anything but a scientific report, and the EPA, being a scientific agency, had no business publishing it. At first this story seemed dead it the water (where it belongs) and I wasn’t going to write anything on the subject, but sure enough the usual sources have been making enough noise that denier friendly outlets in the media started picking up on this. So lest anyone be confused as to the real story behind the silenced report I thought I would write a quick post on the subject. It was probably inevitable. Given the mileage progressives got out of slamming the Bush administration for abusing science, conservatives were bound to bring parallel charges against the Obama administration. But true to their anti-science form, deniers forgot the most important aspect of any censorship claim: substance. the recession will save us! water vapour feedback is negative! Scafetta and West’s statistical fit of temperature to an obsolete solar forcing curve means that all other detection and attribution work is wrong. From this “evidence”, they then claim that all variations in climate are internal variability, except for the warming trend which is caused by the sun, oh and by the way the globe is cooling. One can see a number of basic flaws here; the complete lack of appreciation of the importance of natural variability on short time scales, the common but erroneous belief that any attribution of past climate change to solar or other forcing means that CO2 has no radiative effect, and a hopeless lack of familiarity of the basic science of detection and attribution. 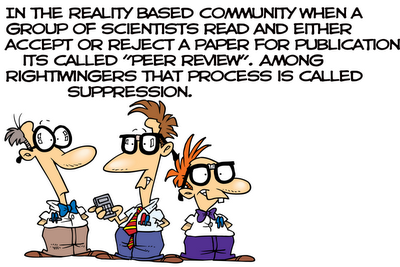 But it gets worse, what solid peer reviewed science do they cite for support? A heavily-criticised blog posting showing that there are bi-decadal periods in climate data and that this proves it was the sun wot done it. The work of an award-winning astrologer (one Theodor Landscheidt, who also thought that the rise of Hitler and Stalin were due to cosmic cycles), a classic Courtillot paper we’ve discussed before, the aforementioned FoS web page, another web page run by Doug Hoyt, a paper by Garth Paltridge reporting on artifacts in the NCEP reanalysis of water vapour that are in contradiction to every other reanalysis, direct observations and satellite data, a complete reprint of another un-peer reviewed paper by William Gray, a nonsense paper by Miskolczi etc. etc. I’m not quite sure how this is supposed to compete with the four rounds of international scientific and governmental review of the IPCC or the rounds of review of the CCSP reports…. They don’t even notice the contradictions in their own cites. For instance, they show a figure that demonstrates that galactic cosmic ray and solar trends are non-existent from 1957 on, and yet cheerfully quote Scafetta and West who claim that almost all of the recent trend is solar driven! They claim that climate sensitivity is very small while failing to realise that this implies that solar variability can’t have any effect either. They claim that GCM simulations produced trends over the twentieth century of 1.6 to 3.74ºC – which is simply (and bizarrely) wrong (though with all due respect, that one seems to come directly from Mr. Gregory). Even more curious, Carlin appears to be a big fan of geo-engineering, but how this squares with his apparent belief that we know nothing about what drives climate, is puzzling. A sine qua non of geo-engineering is that we need models to be able to predict what is likely to happen, and if you think they are all wrong, how could you have any faith that you could effectively manage a geo-engineering approach? It is no wonder this report was quashed. Now compare that to the instances of real science being quashed by the Bush administration. Despite what some have claimed, the two aren’t remotely the same thing. Alan Carlin [the author of this report] is simply not James Hansen, arguably the most famous of many scientists who claimed to have had their work suppressed or in some way interfered with during the Bush administration. You will recall that the Bush administration had taken a stance critical of mainstream climate science; Hansen felt compelled to defend it; and then NASA underlings interfered with his access to the media. That’s a vastly different story from the present one: The Obama administration has taken a stance aligned with mainstream climate science; Carlin is criticizing it; and his scientific claims are not standing up very well. Of course the Environmental Protection Agency can’t use them to help make policy. According to the EPA, Carlin’s claims were, in fact, considered—and rejected. This shouldn’t have ever been a major story. The fact that it has gotten this amount of press is indicative of the disregard for logic and truthfulness of the denialsphere. UPDATE: Chris Mooney makes the point that the Obama administration isn’t immune from conducting its own war on science. I am beginning to detect the smell of desperation in you, O Danny-boy. As usual you comment adds nothing useful. But I am curious what part of this study do you think was new and/or noteworthy that hasn’t yet been addressed?